Quagga and zebra mussels are extremely harmful invasive species capable of destroying aquatic ecosystems, decimating fisheries, curtailing recreational boating and severely impacting all types of water supply and delivery systems. Since their introduction to North America in 1988, it is estimated that zebra and quagga mussels in the eastern U.S. have cost raw water users (such as water treatment plants and power generation facilities) billions of dollars. These newly established and continually expanding quagga and zebra mussel populations in Nevada, California, Colorado, Utah, Texas, Kansas, Missouri, Iowa and Arizona have already created serious problems for recreation, irrigation, power production, domestic water supply, transportation and hatchery production in the Colorado Basin and forced the temporary shutdown of the Southern California Aqueduct which is the primary source of irrigation, industrial, and domestic water for 18 million water customers in Southern California. Power and water providers in the lower Colorado River and California have already spent millions of dollars controlling quagga mussels. This cost and rapid expansion of the quagga and zebra mussels has sent shudders through the halls of state governments throughout the west with new legislation being passed in most western states in 2008 and 2009 with more expected 2010 to facilitate implementation of watercraft interception programs to help prevent the further spread via trailered recreational watercraft and commercial equipment. Zebra and quagga mussels are spread on trailered watercraft moving from an infested to uninfested waterway. A number of national, regional and local program are in place to educate the public on how to avoid transporting them on their boats, including the PSMFC sponsored Watercraft Inspection Training (WIT) program. WIT began in 2006, with USFWS and Bonneville Power Administration funding, to train boating law enforcement personnel in the western US on the background, biology and impacts of zebra mussels; how to identify high risk watercraft and conduct an inspection of all types of watercraft; how to perform a vessel decontamination; and what their legal authority is to stop, detain, and require decontamination or quarantine of watercraft suspected of harboringquagga/zebra mussels. Between April 2007 – December 2009, more than 50 of these basic (Level One) trainings have taken place reaching over 2,500 individuals representing more than 90 entities in 13 western states. In April 2007, PSMFC added a second, more intensive two-day version of WIT called “Level Two”. All Level Two trainings are conducted at Lake Mead. To date Level Two training has been provided on eight occasions to more than 100 individuals. A complete list of all Level Two graduates is provided in the Training Resources section of this website. All Level Two graduates are qualified as first responders and Level One trainers. This training is directed at state, federal and local natural resource and boating agency personnel, water users of all types, law makers, policy makers, and border/lake inspection personnel, marina operators and commercial boat transport operators. 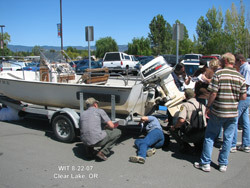 The Level One training program gives a thorough overview of the species and problems caused, and includes information on outreach and education programs, basic mussel biology, distribution, transport vectors, mussel impacts and focuses on how to inspect for and decontaminate trailered watercraft suspected of having zebra or quagga mussels on-board. 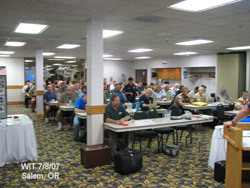 The Level One training includes 4-5 hours with one instructor utilizing a new two-part education and training video produced for this purpose, a informative presentation on national prevention programs, current issues, lessons learned from existing watercraft inspection programs, a question and answer session and a hands-on watercraft inspection exercise. This two-day, intensive, hands-on training is provided free of charge on a first-come first-served basis. Attendees will be responsible for their own travel expenses. The course is designed for those individuals who are currently or will soon become active in setting-up or implementing watercraft inspection and decontamination programs for their respective agencies, organizations or businesses. The class size is restricted to 10-12 people and the focus is on actual inspections of varios types of watercraft and the use of several decontamination systems. It is certified by 100th Meridian member agencies and successful graduates will be qualified as incident responders and Level One trainers. Level two training is delivered over two days (12-14 hours) at Lake Mead located on the Nevada/Arizona Border near Las Vegas. It will focus on actual field inspection of various types of watercraft leaving the lake which may or may not be contaminated with quagga mussels and the decontamination of those watercraft requiring it. 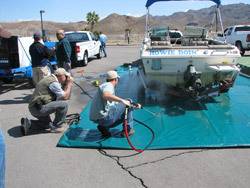 The instruction will include the use of portable (low-cost) temperature controlled power wash units and a large semi-permanent self-contained power washer operated by Callville Marina for the National Park Service. The potential impacts of these invasive species in the west are almost unfathomable. It will severely impact fisheries of all types, greatly increase the cost of power, aggravate already difficult water supply issues and change the quality of life for western residents for all time should they become established in your waterways. Prevention is the only answer. Eradication is almost never an option and control/mitigation is hugely expensive and on-going. That’s why everyone has a stake in learning how to prevent an inadvertent introduction of these mussels on trailered watercraft. Won’t you please join the battle and STOP AQUATIC HITCHHIKERS!!! Zebra mussels have disrupted the traditional aquatic food chains of many inland lakes. Their voracious filter feeding depletes the availability of microscopic organisms that play a critical part in each lake’s ecological food web.